Adventure is guaranteed from the get-go on a Jeep Safari in Mallorca. Explore the west of the island on an awesome off-roading trip! You'll get picked up at 8.30am in the morning by an air-conditioned bus and taken along to a private finca. After the meet and greet, everyone gets split up in to groups based on their language. In no time at all, the multi-lingual guides explain what's what in terms of how to handle the jeeps. The 4x4s in Mallorca can be driven just like a normal car. Please don't forget to bring your driving license as you'll have to show it before the Mallorca jeep safari starts. If you don't fancy driving, you can take part in the Mallorca jeep tour as a passenger and make the most of the exceptional landscape served up by the Tramuntana mountains. During the jeep safari in Mallorca, you drive offroad through Serra Tramuntana and come across pine forests and fascinating mountainous scenery. At various look-out points, the drivers can stop off and take in the views without having to focus on driving. The tour guides explain lots of interesting facts about the culture and nature in Mallorca. Around noon, get to know the traditional Mallorcan cuisine at an old olive mill in the mountains (bookable there and then: €12.50 for adults and €7.50 for children) or bring along your own food. On top of that, you can use the pool in summer and cool off after lunch. Now the Mallorca jeep safari continues over sticks and stones, back to the car park and from there, you'll be taken back to your hotel (at approx. 5pm). Live life on Mallorca's wild side and get close as ever to the Tramuntana mountains on a jeep safari in Mallorca! Explore the Tramuntana with its steep hillsides, fascinating views and picturesque pine forests. You get split into groups and talked through how to manage the jeeps. A jeep is much like a car to drive but of course a little bit bigger. A driving licence is a must so please make sure you bring it with you. You need to be at least 21 years old and have been driving for at least 3 years. However, passengers are more than welcome to come along to enjoy the ride. Go hurtling through the wild countryside in Mallorca with up to 39 other jeeps behind and in front of you. Thanks to the 4-wheel drive, you can climb the slopes and hit the curves without a care in the world. Go cruising through the woods and get shown the watering system invented and developed by the Moors. You might spot some goats and sheep along the way. About half way through the tour, stop for a bite to eat at an old olive mill. Delight in a typical Mallorcan lunch for only €12.50 for adults and €7.50 for children. There is bread with alioli and olives, Pa amb oli (typical Mallorcan bread with ham & cheese) or stew, then dessert and water or wine is served (of course not for the drivers). Take a dip to cool down in the heat in summer. This is sightseeing with a twist. You get dropped back to your hotel at around 5pm. We did the evening tour on the 25th of July. My husband drove, my son and I stood behind. It was sooooo great! We had fun! Add to this amazing landscape, including goats and sheep. The food was ok for the price. Steffi and Doris were very nice and humorous guides. The show at the dinner was a bit over it, but funny. I can recommend the safari to everyone !! Wir haben die Abendtour am 25.7 gemacht. Mein Mann ist gefahren, mein Sohn und ich haben hinten gestanden. Es war soooooo toll! Wir hatten echt Spaß! Dazu diese Wahnsinns Landschaft, inklusive Ziegen und Schafen. Das Essen war ok für den Preis. Steffi und Doris waren sehr nette und humorvolle Guides. Die Show beim Essen war etwas drüber, aber witzig. Ich kann die Safari nur jedem empfehlen!! It was a beautiful and exciting day. Our troupe was funny and Rob and Matthias did a fantastic tour and intervened when necessary. The drive to the olive mill was however very long, so we all already complained about hunger. Unfortunately we went back directly. Because I would have shared the tour better, as some routes were double-traveled. At the small stops we got great information about Mallorca and then you could change the driver. Thank you for this wonderful experience !!! Es war ein wunderschöner und aufregender Tag. Unsere Truppe war lustig und Rob und Matthias haben die Tour super geführt und eingegriffen wenn es notwendig war. Die Fahrt zur Olivenmühle war jedoch arg lang, sodass wir alle schon über Hunger klagten. Zurück ging es leider auf direktem Wege. Da hätte ich die Tour besser geteilt, da auch einige Strecken doppelt befahren wurden. Bei den kleinen Stopps haben wir tolle Infos über Mallorca bekommen und man konnte dann auch den Fahrer wechseln. Danke für dieses wunderschöne Erlebnis!!! The Jeeep Safari was awsome! It has extremely good fun offroad driving through the area. The guides have a lot of patience even if you do not get even a curve right at the beginning;) The nature and the scenery is simply impress, so I make the trip every nature lover to his heart, who also wants some action on vacation. The break in an old olive mill was also good. There was food typical Spanish and you could even cool down in the pool. A star minus there, because the people who have brought their own food you were not allowed to eat with us at the table. I thought that was a bit of a shame. But otherwise a great tour with mega fun! Die Jeeep Safari war einfach klasse! Es hat extrem viel Spaß gemacht offroad durch das Gelände zu fahren. Die Guides haben sehr viel Geduld auch wenn man mal eine Kurve nicht direkt am Anfang kriegt ;) Die Natur und die Landschaft ist einfach beeindrucken, daher lege ich den Ausflug jeden Naturliebhaber ans Herz, der auch ein bisschen Action im Urlaub will. Die Pause an einer alten Olivenmühle war auch gut. Es gab typisches spanisches essen und man konnte sich sogar im Pool abkühlen. Einen Stern minus gibt es, da die Leute, die ihr eigenes essen mitgebracht haben nicht mit uns am Tisch essen durften. Das fand ich ein bisschen schade. Aber sonst eine klasse Tour mit mega viel Spaß! Hello! We at 16.05. participated in the safari and were completely thrilled. Great tour through the mountains, nice guys and a delicious local food in a nice atmosphere! Can only be recommended! Unfortunately for not wearing the original driver´s license we had no chance of driving the jeep, on the one hand was almost better because then you can see the view. My advice to have the necessary documentation on the tour. I recommend it for people looking to spend a fun day with more tourists. No stress and to marvel of nature. The price is really expensive, but I do not regret anything, the Tramuntana is only play I were a clear day so it came to appreciate much of the island. The Jeep safari itself was fun, but the eternal collection does lose many hours. In high season it is a lot of fuss so I recommend off season. Dear Jeep Safari team, hello Stephi and Matze, I was with my two girlfriends in September traveling with you, we have had a lot of fun. Should I again make Majorca holidays I will definitely stop by again with you, keep it up, all the best for you. Hallo liebes Jeep Safari Team, hallo Stephi und Matze, ich war mit meinen beiden Freundinnen im September mit euch unterwegs, wir haben viel Spaß gehabt. 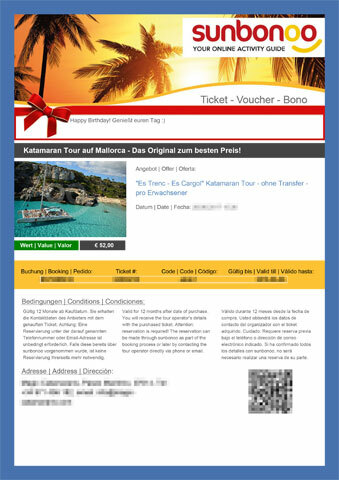 Sollte ich noch einmal auf Mallorca Urlaub machen werde ich bestimmt bei euch noch einmal vorbeischauen, weiter so, alles Gute für euch. The jeep tour was really the hammer - the images here correspond 1: 1 of the Tour. The guides were very nice, it was previously divided into appropriate groups (German, Dutch, French, etc.). In total there were determined over 100 participants on site. You could his Jeep itself choose who had no driver could place in the (larger) take the Jeep Guides. The tour is really about 100% off-road driving, extremely steep and rough terrain is tackled. The nature here is truly stunning. The facts: It is moved a distance of about 20km, driving time approx 4-4.5 hours. My top speed was 45km / h, mostly it is, however, with about 3-8km / h on the road because you will encounter large holes and deep chasms churning. Since it is shaken violently. So why only 4-5 stars? A star deduction I have to give for rip-off while eating. a meal One must not divide, and to top it: Only those who have paid for a meal, may also sit at the table. All others must sit on a bench a little off. So if for example, with a group of 4 people on the road is, but it will only 1-2 Essen, may adopt in the actually very nice break incl. Pool of today. I have determined forgot to mention some, but this jeep tour you have to experience for yourself anyway - it is worth the money every time! ps: The arrival own way, is not possible, you have to be picked up at one of the assembly stations. All in all, however, this has worked well. ps: Die eigene Anreise ist übrigens nicht möglich, man muss sich an einem der Sammelplätze abholen lassen. Alles in allem hat das aber gut geklappt. For all that were not there! A must in Mallorca! Gruss Axel and Jacko! Für alle die noch nicht dort waren ! Ein muss auf Mallorca ! Gruss an Axel und Jacko! The jeep safari was very adventurous and totally has a lot of fun! Kudos to the Guide. Die Jeep Safari war sehr abenteuerlich und hat total viel Spaß gemacht! Großes Lob an den Guide. You're reviewing: Go off-roading in Mallorca: Jeep safari in the Sierra Tramuntana. How do you rate this product? Is the tour suitable for persons in a wheelchair? No, unfortunately this tour is not suitable for persons in a wheelchair. However, the Jeep Safari in El Arenal (Safari Beach) is suitable for disabled persons in a wheelchair. We have 3 children. Would it be possible to take them in one jeep? Yes, this is possible. Two adults may sit in the front seats and up to 3 children (or 2 adults) may sit on the rear seats.